Ms. DiPaolo Love moved to Santa Fe with her husband, Steve and their daughter, Olivia in 1994 from New York City where she had a successful career as an actress and spokeswoman in TV commercials and voice-overs. As the mother of a six year old, she was able to segue easily into the school volunteer corps and found that it suited her New York energy. Her contributions have included chairing school fund-raising galas and auctions and organizing performances by Margie Gillis and the Pilobolus Dance Troupe in Santa Fe to benefit SW C.A.R.E. She was active as a Pony Club mom and served as USPC District Commissioner during her daughter’s local Pony Club membership. 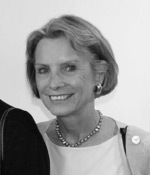 Linda first became involved with NDI-NM during the 1999 Gala as a committee member. She has since chaired or co-chaired several NDI-NM Galas and sits on other board committees as well. Linda and her dog, Paya have been certified by the Santa Fe Animal Shelter’s Pet Outreach to visit hospitals, nursing homes and are in the Reading to Dogs program in the SFPS at the elementary school level. Animals have always been an important part of Linda’s life. She rides her dressage horse daily and presently has one cat and the aforementioned Paya. Her daughter, now 25, is a student at CSU Veterinary College in Ft Collins paying the animal love forward.